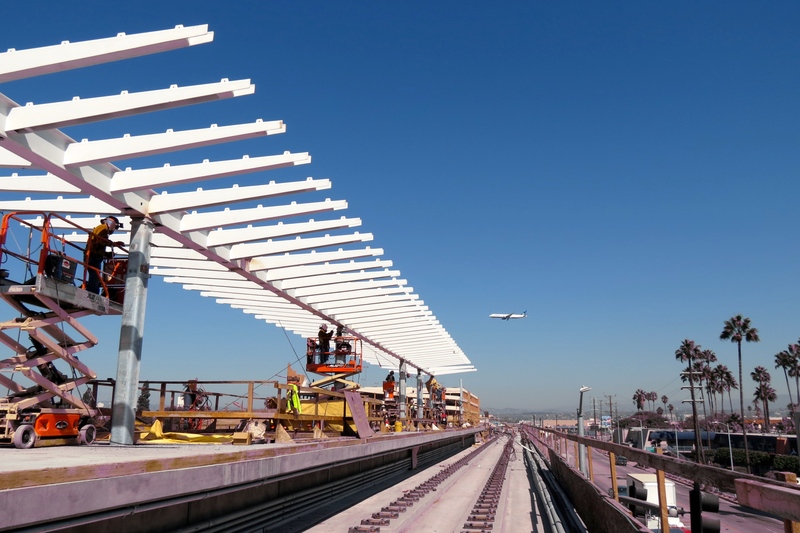 The canopy being installed at the Aviation/Century Station on the Crenshaw/LAX Line. Photo: Metro. As we’ve noted often in this space, transit ridership at Metro and many large transit agencies has taken a pronounced dip in recent years. There are likely a number of reasons why: a strong economy, lower gas prices, lower car prices, transit service issues and the popularity of services such as Uber and Lyft that will take you door-to-door for prices often far less than a traditional taxi. That last point has mostly been based on conjecture and anecdotal evidence. 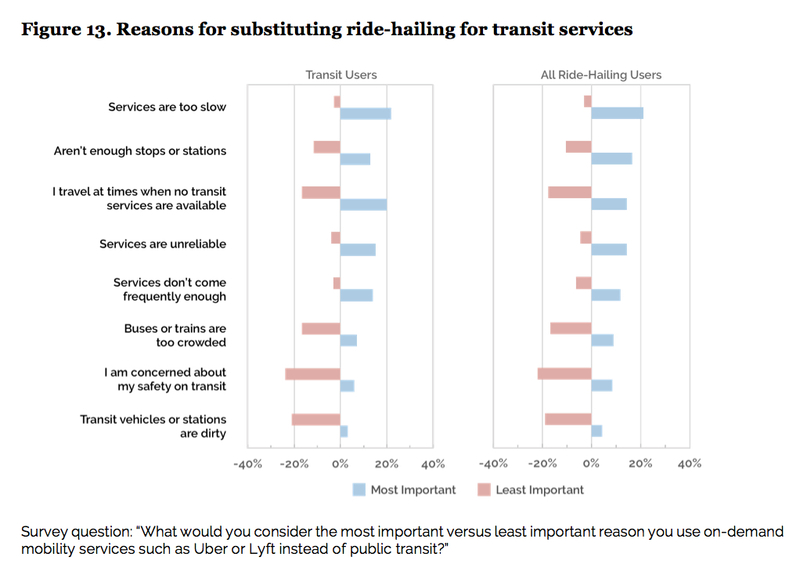 But a new UC Davis study based on surveying Uber and Lyft riders has burped forth this week and offers some more compelling data about cheap taxis (as I like to call them) and transit. As would be expected, a lot of transpo observers are focusing on something else in the study: in cities, the presence of cheap taxis probably means more overall driving by vehicles on the road. That’s not exactly huge news — others have suggested the same thing — but it’s still a blow to the idea that cheap taxis are seriously transforming the way we get around. The finding also suggests that self-driving cheap taxis will NOT magically make traffic congestion disappear, as some have suggested. Again, not a shocker to those who have actually thought about the issue. I thought there was one other finding that was interesting and somewhat new. Many people like to say that cheap taxis reduce the need to drink and drive. That makes sense. I don’t use cheap taxis much, but I have definitely used them after tipping a few too many. As have many folks I know. But…the National Highway Traffic Safety Administration (NHTSA) released its annual traffic fatality data last week and, sadly, traffic deaths and drunk driving deaths rose in the past year. So did the number of miles driven and other types of deaths (motorcycle, pedestrian and bicycle). All no bueno, of course, although distracted driving deaths were down. •Consumers have made it clear they like cheap taxis for certain types of rides but it’s not really revolutionizing the way we get around. 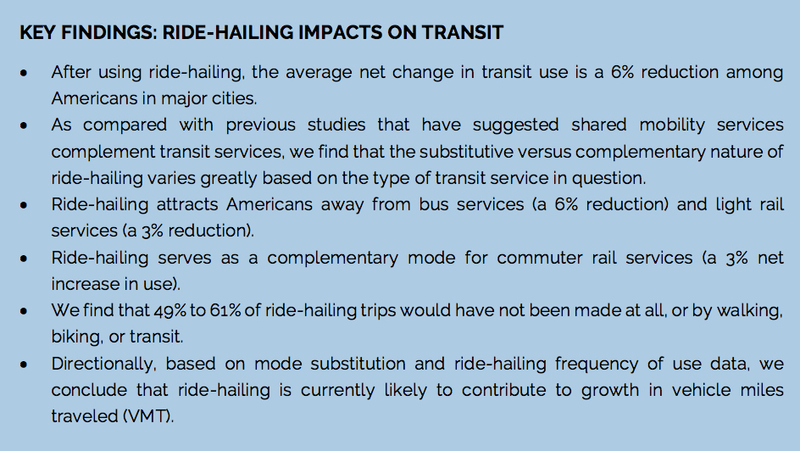 A lot of people aren’t using the cheap taxis and the cheap taxis aren’t seriously impacting transit use for many people or car ownership. 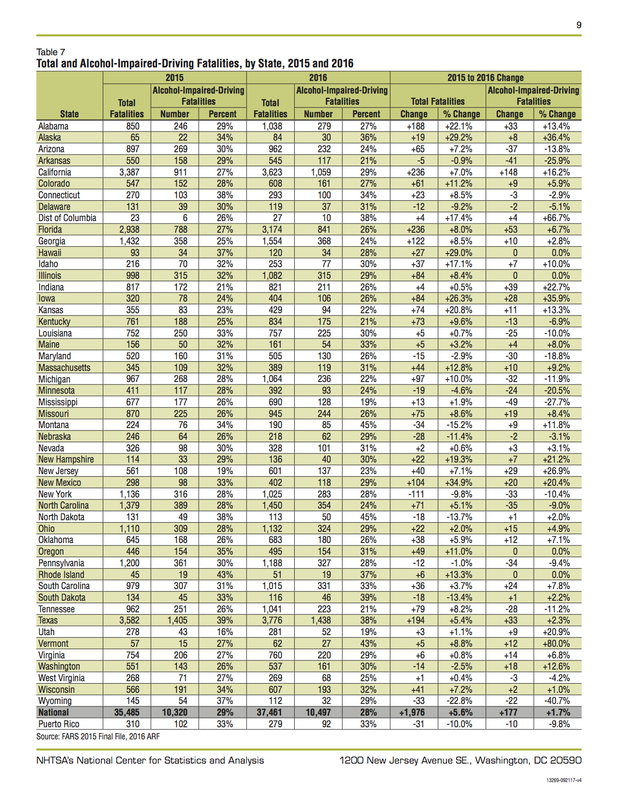 •This study should tell transit agencies what I pray the should already know: fast, frequent service goes a long way with riders. •There may very well be a good way for cheap taxis and transit to be complimentary to one another — but the evidence is that no one has quite hit the bullseye on that one yet. As many of you know, Metro will be trying to run a MicroTransit service that uses some of the best features of ride hailing — and that could result in a better transit experience for riders. Read all about it here. •This study and others surely to follow will help cities decide what, if anything, they should do about cheap taxis. Sure they may increase the number of vehicles on the road, but they also may save time and make it easier and cheaper for folks to get around. If transit backers don’t like it, they perhaps should look in the mirror first and figure out how to win back market share. I recall that in the San Francisco of the 1960’s, (Note this was the 50th birthday of the “Summer of Love”) a fleet of personal vans called “jitney’s” cruised up and down Mission Street skimming patrons from the slower, more costly Muni buses. Eventually the city axed the jitneys, which I think were in service for decades, to cut down on the Muni’s competition. This Uber issue seems like “deja vu all over again.” As a former member of the UCD family and a patron of its great Unitras bus system, I can say that I have seen the socio-transit battles of the future and I am glad I won’t be there! PS: Oh, BTW how much did that study coast? The problem with Uber and Lyft is that they don’t reduce traffic congestion. In fact, if users choose them over transit, they actually will increase traffic congestion. Same with diver-less cars. Their primary use should be to be to solve the first-last mile problem. Exactly right, you can’t solve auto congestion by adding more autos. Or, to put it another way, Savio’s First Law of Contemporary Governing: “If you are part of the solution, you are part of the problem.” The Road Diet/Bike Lane quandary is yet another example. The troubling issue for Metro is: if transit usage goes down and thus Metro employment shrinks, where else in LA-LA-Land is one going to find middle management jobs that pay $200,000+ salaries with, effectively, 100% pensions? One middle management staffer in the Union Station division, pulling down $200,000+, actually asked in a public meeting why LAUS was so far from downtown?! This person has since been hired away, apparently with a raise in pay. (So maybe there is hope yet for furloughed Metroistas.) Sometimes, when dealing with Metro, I get the feeling that I am living in an old-rerun of *M*A*S*H*. – complete journeys to 7MC on two occasions when Expo trains broke down or were halted for other reasons. – and once from my office to 26/Bergamot when it was raining too hard to mess with the BikeShare or walking. The only place it seems like Microtransit could replace my car would be between my house and NoHo, but I’m not sure it can beat the flexibility of my car and the $60/month for parking at NoHo. I was doing the Burbank bus, but it was 30-40 minutes slower than driving. Microtransit could be slightly faster than the bus, but doubt it’s as quick as my car. Not to mention the speed-to-hail, since without AT&T cell coverage on the Red Line, I wouldn’t even be able to summon a ride until after I re-surfaced. But, I hope it’s successful – a way for Metro to essentially establish new mini-transit-lines and a way to collect data on where full-size-transit should be adjusted. But I only see that working if it’s heavily subsidized for participants who don’t have other alternatives and/or for events where tiny-transit is overwhelmed (the rideshare area at the Hollywood Bowl is obnoxious, but a bad example since the full-size bus shuttles to remote parking lots really work well). I know this is off topic, but what on earth is the deal behind this?? But to stay on-topic: Yes, they can co-exist. I believe all transport modes available all complement each in one form or another. I find that cheap taxis are very complementary to transit. One example. If I want to get from, say, Koreatown to Pasadena for dinner on a Friday night, I take transit. The trains are fast and completely unaffected by rush hour traffic. But later, when the trains don’t run as often and rush hour is over, I take Lyft home. The fact is, if it weren’t for Lyft, I wouldn’t take transit half as much. Driver training – can it be improved for safer rides? Should the drivers be drug-tested? Hours of service – should all cities follow Chicago’s example and require all rideshare drivers to drive no more than 10 hours a day? Driver pay – would slightly increased driver pay reduce traffic violations such as speeding and red light violations? These are, in my opinion, some of the questions that need to be answered about ridesharing before platforms such as Uber and Lyft cement their place as a major transportation option and make sure that their licenses are renewed (see London). Also, in big cities such as Chicago transit might be faster than ridesharing, at least during rush hour. That is the reason why a lot of people still prefer transit over ridesharing or choose ridesharing just to cover the distance between their home and the train station.